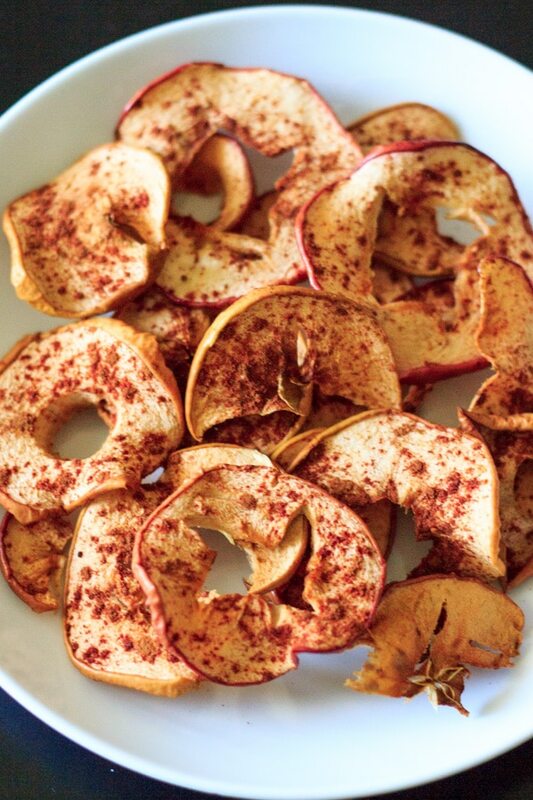 Cinnamon apple chips. No added sugar, no dehydrator required! Vegan, gluten-free, and healthy snack any time. While I might not be able to provide you a new recipe every day of October, I may just be able to pull off a recipe for each day this week! Today, we will start with cinnamon apple chips. 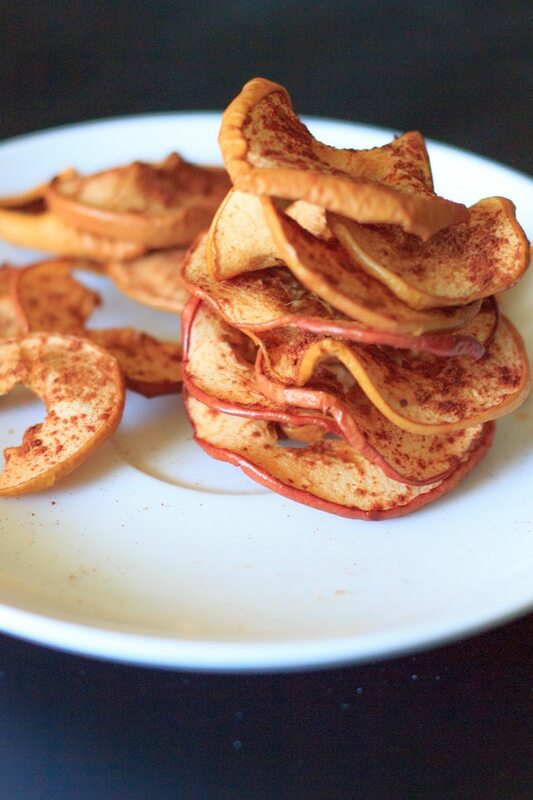 You can add pretty much whatever you want to apple chips, a common topping being cinnamon and sugar. I opted for only cinnamon without the sugar, but you can add some if you want a little more sweetness. Though in my opinion, the cinnamon alone is enough flavor! This is a great way to use up some apples and make them last a little longer. Slice, sprinkle & bake for 1 hour each side (2 hours total) at 200°F. 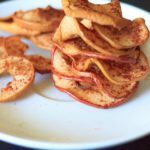 Cinnamon apple chips are a healthy snack that kids and adults will both love. The best part is that you do not need a dehydrator to make them! Dehydrators are pretty cool, don’t get me wrong. But they do take up a lot of space. What other apple snacks do you love? Apple nachos are one of my favorites, and is actually the most popular recipe here on the blog! Thinly slice the apples, removing any seeds. Bake for 1 hour. Flip the apples. Bake for another hour. Let apple chips cool, and eat! YUMM! i’ve been making these for quite some time and also put gingerbread spice on top of them. I’ve foudn out that it’s great to dehydrate lots of fruits and veggies and then adding some spices. My other favourite creations are carrot with cumin, sweet potato with turmeric and beetroot with oregano. Great suggestions Stephi, I really want to try to dehydrate sweet potato now! Gingerbread spice sounds delicious, do you know how to make your own blend? How do you get them crispy? Mine came out soggy. I think the trick is to cut them as thin as possible! Just made these! They are excellent. I did have to cook them for longer to get them to start to crisp but still very good. Thanks for sharing! I noticed mine crisped even more after I took them out of the oven, but since it’s a lower temperature for such a long time I’m sure ovens vary. Glad you liked them, thanks for reporting back Amanda! Do you like these best with any certain type of apple? Great recipe! Would 1 hour be enough if the heat is coming from both top and bottom of the oven? Wondering how long these keep? I’d like to make them in advance, and store them. Awesome Linda, glad to hear they are kid-approved!